The Toledo Mud Hens of the International League are next. 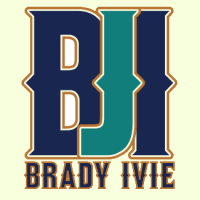 Having been reassigned to the Tribe, the team makes a slight change and adopts the colors of their new parent club. The Tribe's feather logo is modified and added to the wordmarks to give a splash of color and to hearken to the Tribe. The team's food identity is that of the Cincinnati Chili (albeit making them the most disgusting uniforms of all). 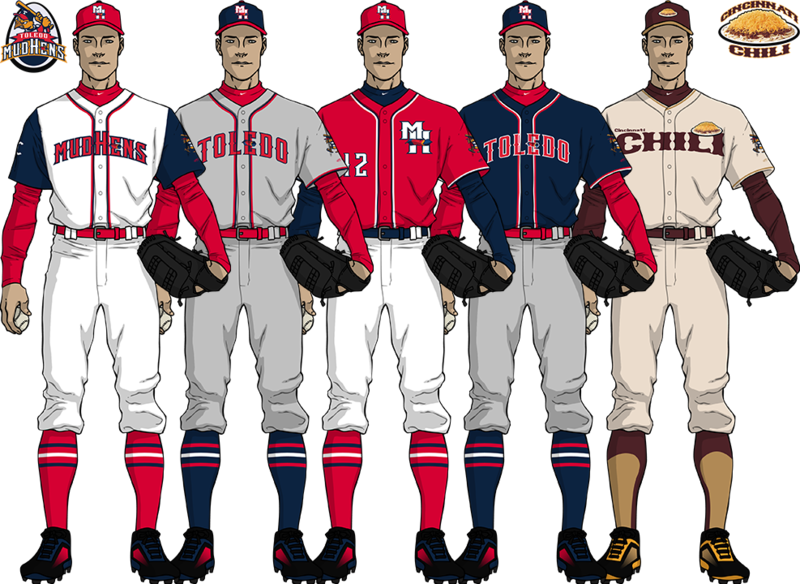 Nice work on the Mud Hens, but I'd leave the "Cincinnati" off the Chili's jersey. It just looks a little unnecessary. I left it on there because it's not just chili, it's Cincinnati chili, and leaving off the "Cincinnati" would be an insult to any real forms of chili. The next team ready are the Memphis Blues. The top affiliate of the Music City Strings, the Blues are named after the specific genre of Memphis blues. The team uses a neon font for their uniforms and logos as a tribute to Beale Street, specifically BB King's Blues Club. 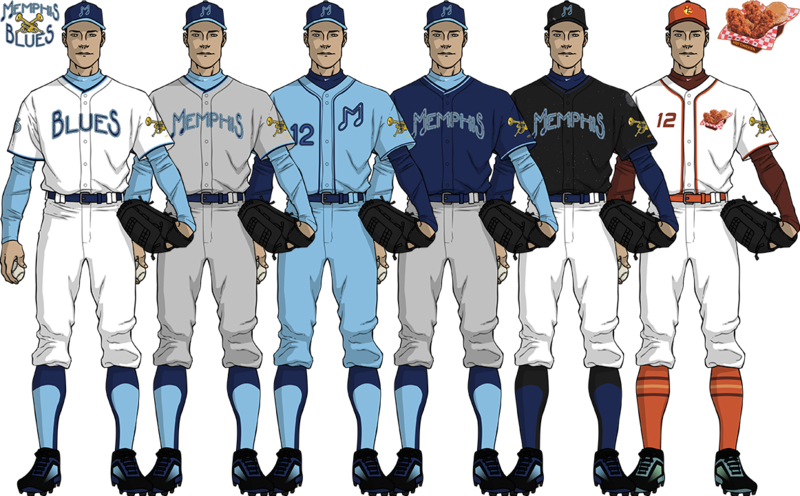 They also have a black "Memphis Nights" uniform that makes the neon effect stick out even better. Their food-based identity makes them the Tennessee Hot Chicken. The Blues look great! I love that powder blue alt. Coming up from the on-deck circle are the Iowa Oaks. 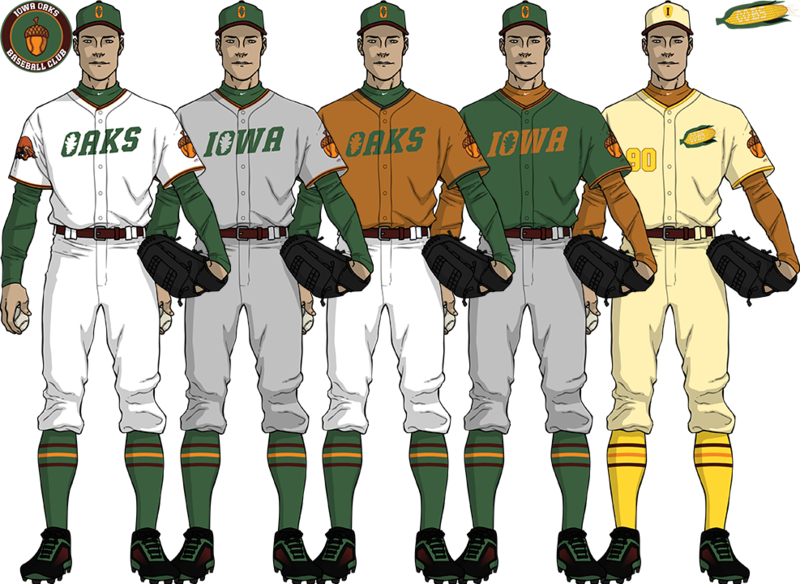 Named after the state tree of Iowa, the Oaks come out of Des Moines in green, orange, and shades of brown. With an acorn surrounded by a roundel as the main logo, the team uses the name "Iowa Cobs" as their alternate, a play on the former (per this concept) Iowa Cubs. My favorite part of this concept is the negative-space "O" with an oak leaf outline in the center. The only way it could get even more Iowa is if there was a Caucus alternate a la the New Hampshire Primaries. The Bakersfield Breakers come next. As the top affiliate of the Dodgers, the team is named after an earthquake from 1952 that destroyed much of the city. The logo depicts the First Baptist Church, also called the Bell Towers, the only religious structure to survive the quake. The team colors are those of the building's gray stone, orange roofing tiles, and complimentary red, black, and gray. 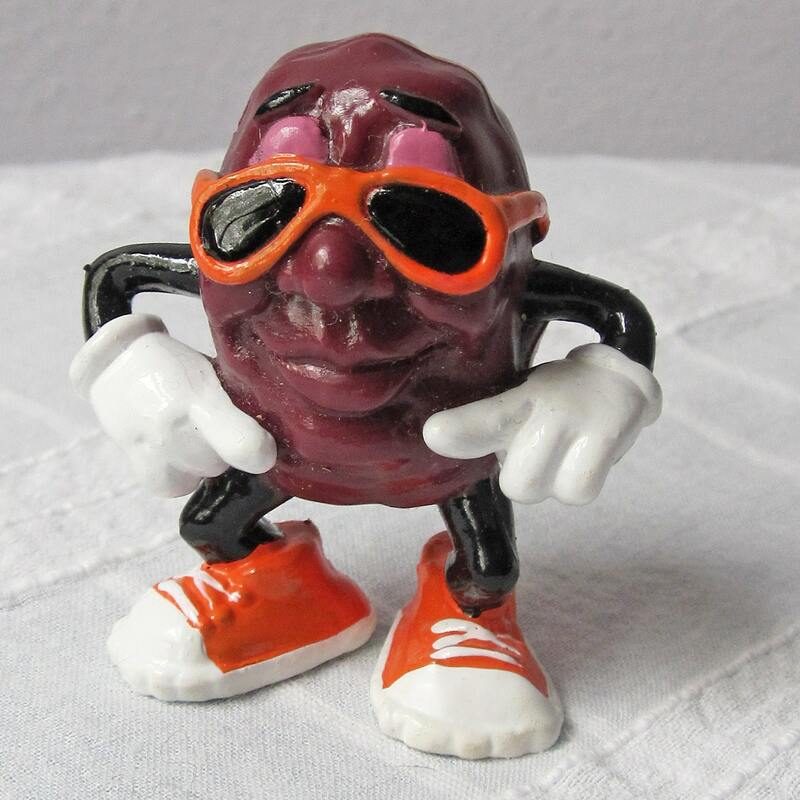 Their alternate identity is that of the Bakersfield Raisins, which came as a result of the old "California Raisins" commercials. As a huge childhood fan of the California Raisins, I love that Raisins alternate. The only thing that's missing is a pair of sunglasses somewhere. The Oaks look great as well. That one is good enough to pass for a MLB concept. I added sunglasses to the player, but I don't think putting them on the raisins would be acceptable with copyright laws. 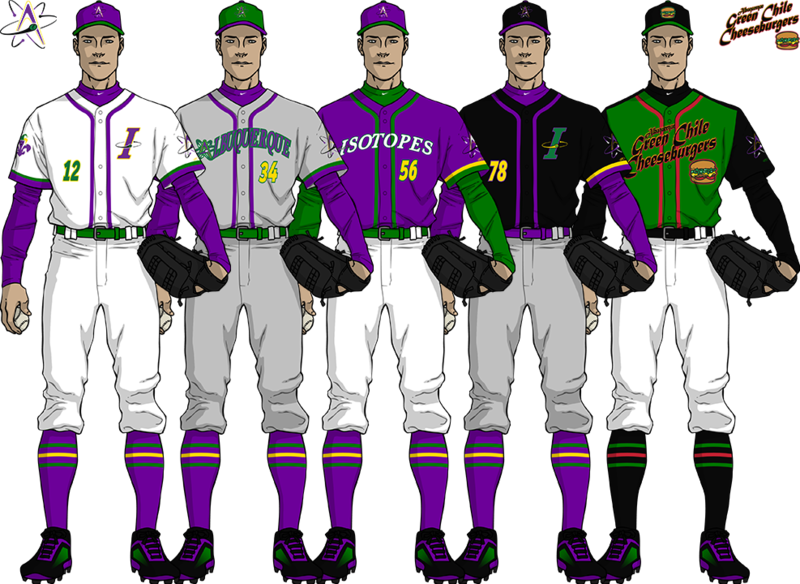 Here are the uniforms of the Albuquerque Isotopes, AAA affiliate of the new New Orleans Krewe. The team is rebranded in black and the Krewe's colors. The atom "A" stays but is recolored, while the team's "I" changes font. The team also retains the identity of the Albuquerque Green Chile Cheeseburgers, with only slight changes to the uniforms. The 'Topes look good, but I would incorporate more yellow and green into their uniforms. I've gone ahead and made that change, making the Isotopes match the Krewe in terms of colors a little more. The Durham Bulls are next to the plate as the top affiliate of the expansion Trout. The team maintains the blue and orange they currently use and are given new wordmarks on the road and orange uniforms. The team's food identity makes them the Durham Sweet Potatoes, as North Carolina produces more of that vegetable than any other state. 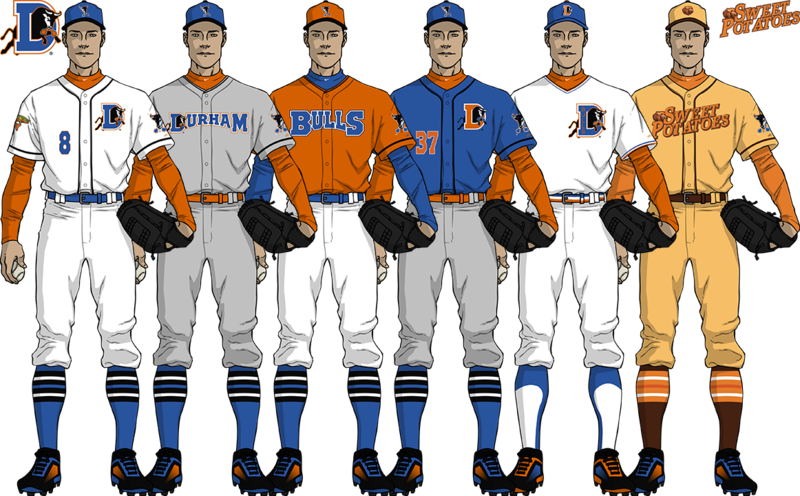 They also have a "Bull Durham" uniform based off the home uniforms from the movie. Nice job on the Bulls! I really like the pullover alt. 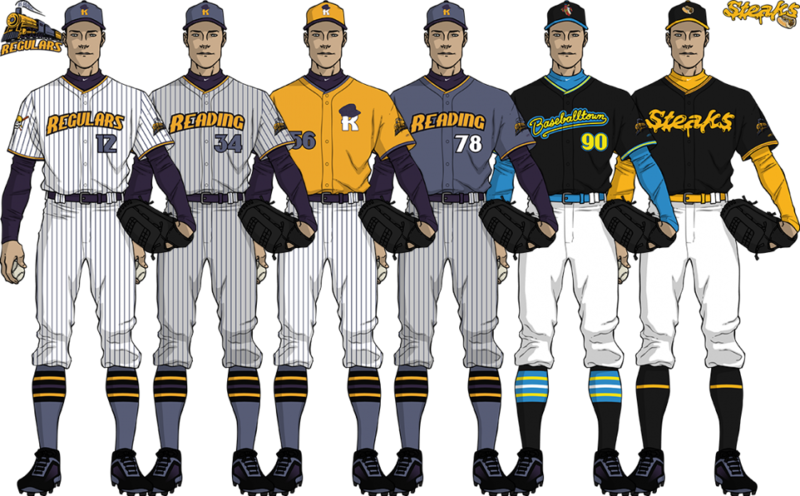 Here are the uniforms of the Albequerque Isotopes, AAA affiliate of the new New Orleans Krewe. The team is rebranded in black and the Krewe's colors. The atom "A" stays but is recolored, while the team's "I" changes font. The team also retains the identity of the Albequerque Green Chile Cheeseburgers, with only slight changes to the uniforms. Check spelling on Albuquerque. Looks good!! I just KNEW I had something wrong. It's now been corrected. 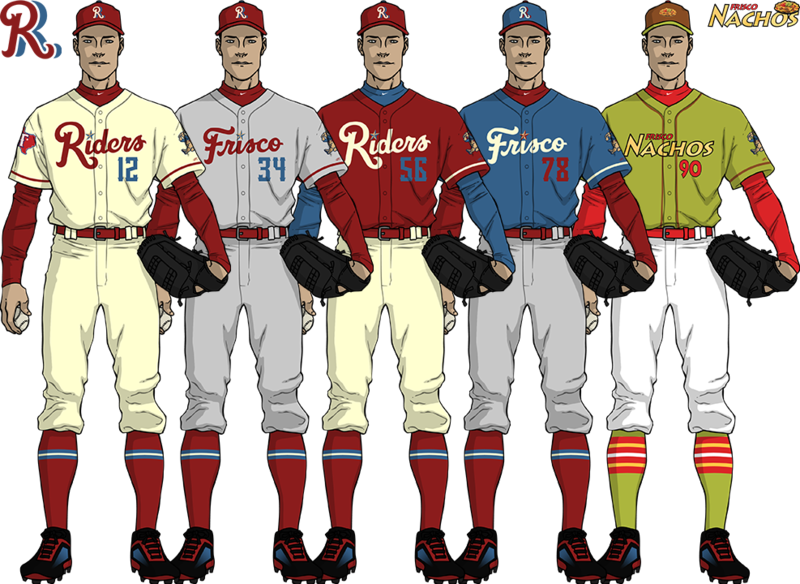 The Frisco RoughRiders are next. The uniforms remain largely unchanged with a blue cap added to the mix. Their food identity are the Frisco Nachos, with a guacamole green uniform and beef brown cap. The Reading Regulars are the next team I have ready to go. The name comes from regular passengers of the Reading Railroad. 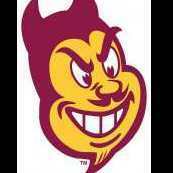 The team colors are coral blue, purple, and gold. 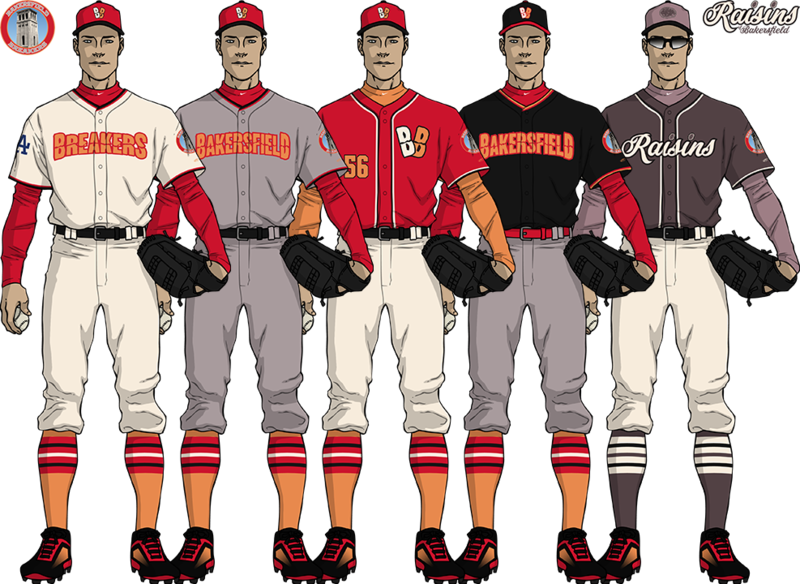 The team takes the IronPigs' "Cheesesteaks" identity (because they already get bacon, stop being greedy with food, Lehigh Valley), becoming the Reading Regulars. The team also maintains their "Baseballtown" identity, with the Bunbino hot dog on the cap. Nice job on these last two teams. However, the cap on the Regulars' "R" logo looks a little awkward. If you can't get it to look a little more natural sitting on the "R," I would remove it altogether. I think I've gone ahead and corrected the issue with the cap, as it now sits more even. 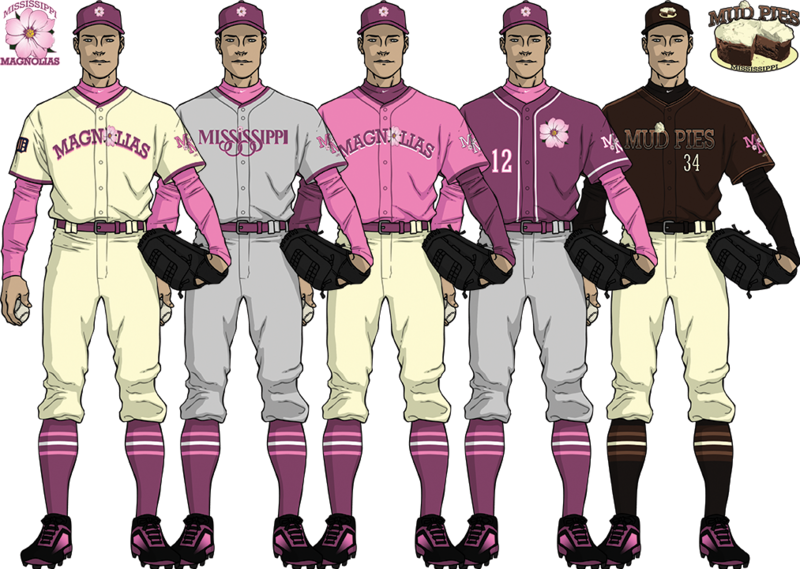 The next team up are the pink-and-purple Mississippi Magnolias, the AAA-affiliate of the Tigers. Named after the state's official flower, the road uniform's wordmark comes from the Mississippi Tourism Department. The food identity uniforms are for the Mississippi Mud Pies.